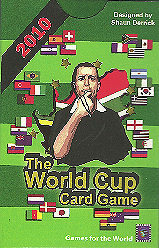 The World Cup Card Game 2010, unsurprisingly, is a card game version of the board game The World Cup Game, centred on the 2010 tournament. Designed by Shaun Derrick and published by Games for the World, it is simply a deck of cards and a two page rule sheet. This makes it very portable and good value for the £6 price tag. The game is split into two phases: The group stage involves the 32 teams in 8 groups playing in a round robin league format. Each team receives 7 or 8 cards and the team manager will choose between 1 and 4 of the cards to allocate to each of their three matches. The cards vary between goal cards (1-3 goals depending on the strength of the team); attack cards, a pair of which counts as a goal and a singleton giving a chance at a goal based on the draw of a further card; penalty cards which are similar to singleton attacks but with a greater chance of scoring; defence cards which cancel attack cards; and foul/offside cards which cancel goals or attacks. Games are quickly resolved but choosing how many cards to allocate can be tricky as you need to determine which games you need to winn or can afford to lose. Still, if you've drawn rubbish cards to start with, you aren't going to create many scoring chances however hard you try to perm them. Once all 24 matches have been resolved, the top 2 teams in each group progress to the second phase, the knockout stage. Game play is different here and more closely follows that of the board game. All the teams in a round are available for players to play cards against up to a maximum of four cards for each team. However, goal and attack cards can be covered by foul/offside/defence cards to negate their advantage. Once all cards have been played, each match is resolved and the winners move on to the next round. At this stage, players who no longer have a team left in the tournament cease taking part in the card play and are just left to cheer / heckle the remaining managers. Drawn games in the knockout are resolved by penalty shoot out, which means that England will inevitably lose by these means at some stage in the tournament. Eventually, the final is resolved and the winning team/manager is crowned champion. TWCCG is a fun game to play and has some interesting tactics but is to a great extent dependent on the cards you draw. I found the group stages more interesting than the knockout as allocating cards between three games involved more planning and guessing what the other team managers would be doing; the knockout was in the main just an exercise of placing good cards on your team and bad cards on your direct opponent so really came down to who had drawn the better cards. Still, the game is easy to play, gives lots of opportunity to cheer your own good fortune or laugh at others' misfortune, and is one that is easily played anywhere as it is simply a deck of cards. You do, however, need to download the score sheet to keep track of the tournament. We all enjoyed our first game although it took us just a bit longer than the 75 minutes advertised on the box. However, this is another good addition to the collection and will definitely see more play as we get closer to the real tournament.